- a versatile and inexpensive solution, designed to help keep your home clean and fresh. - a comprehensive service available to landlords and tenants, designed to deliver professional grade results. - a service which is safe and suitable for all types of natural and synthetic fibre carpets and rugs. Our Cleaners in Windsor specialise in a number of professional cleaning solutions designed for optimal efficiency and value for money in Windsor. Our service range covers a large number of general and specialised requirements for private and business customers. From basic domestic cleaning to technical services like steam cleaning and pressure washing – we have the know-how and technical capacity to deliver consistent, quality results without errors. In order to yield industry standard results worth our customers’ time and money Monster Cleaning has made sure that our cleaners and equipment are up to the task. We employ qualified and experienced cleaners who know their work inside out. We train our teams in the safe and efficient use and application of professional grade cleaning systems. This allows for reduced service time, minimum material waste and better results no matter how basic or complex the job. The cleaning products and materials we use are nontoxic and specially formulated to dissolve and evaporate without trace or residue. We have brought the use of aggressive cleaning supplies to minimum and use mild formula products instead, whenever possible. Domestic cleaning in Windsor – a versatile and inexpensive solution, designed to help keep your home clean and fresh, whenever and however you require and with minimum cost. The service is completely customisable in order to cover your individual requirements. Fixed schedule domestic cleaning can also be arranged for. Additional options such as steam cleaning can be included in the service. End of tenancy cleaning – a comprehensive service available to landlords and tenants in Windsor. Designed to deliver professional grade results in all rooms and areas of the property. Cleaning can be modified to cover specific needs, again – additional options like steam cleaning for carpets and upholsteries can be included. Tenancy cleaning comes with 100% money back guarantee and 10% discount when booked by landlords. Carpet cleaning – safe and suitable for all types of natural and synthetic fibre carpets and rugs. Use of professional steam cleaning equipment. Highly effective in stain removal and eradication of bacteria. Can safely be performed on a regular basis without damage or alteration to carpets/rugs. Carpet cleaning is available for as little as £22 an hour! Oven cleaning – the quick and easy way to keep your oven clean, fresh and ready for work. Cleaning method is suitable for all types of oven models, including self-cleaning ones. No risk of damage to coatings, surfaces and appliance features. Minimum use of caustic and aggressive solvents. Can be performed on a regular basis. Some of the other services we have on offer include specialised patio and driveway cleaning – an excellent way to brighten up worn surfaces and materials, and bring them back to their former good looks without risk of damage. 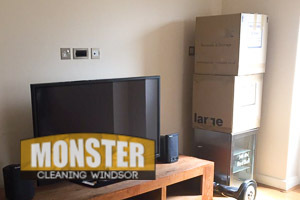 Monster Cleaning Windsor also offer full scale solutions like after builders and post renovation cleaning – excellent value for money and A to Z coverage of all requirements. Business customers can take advantage of professional office and commercial establishment cleaning at very reasonable prices. Fixed schedule commercial clean-ups are also available. Most of the time professional cleaning is the only way to deal properly with specific requirements which are otherwise a problem. Specially designed solutions deliver the necessary standard of results without guesswork or margin for error – this in itself makes professional cleaning worthwhile in nine out of ten instances. Maintaining good indoor hygiene at home or in the office on a regular basis can be a problem so in this case professional cleaning provides not only great results but much needed convenience. Regular service carried out by qualified cleaners will notably improve hygiene and provide for a healthier living and working environment. Price is a determining factor when people make a choice on whether to use professional cleaning or not. In many cases specially organised services actually save money and provide better value for money, especially when using a single service provider to cover all your requirements. Convenience is perhaps one of the most important aspects of using specialised cleaning solutions in Windsor. Use of professional services means your home or establishment is cleaned and maintained whenever and however you need without having to worry about anything. Setting up a regular cleaning service for your house or office is an excellent way to bypass the hassle of having do your own house or office keeping. These are just some of the many advantages you get by using specially organised cleaning services so make life easier on yourself and book your cleaners today!